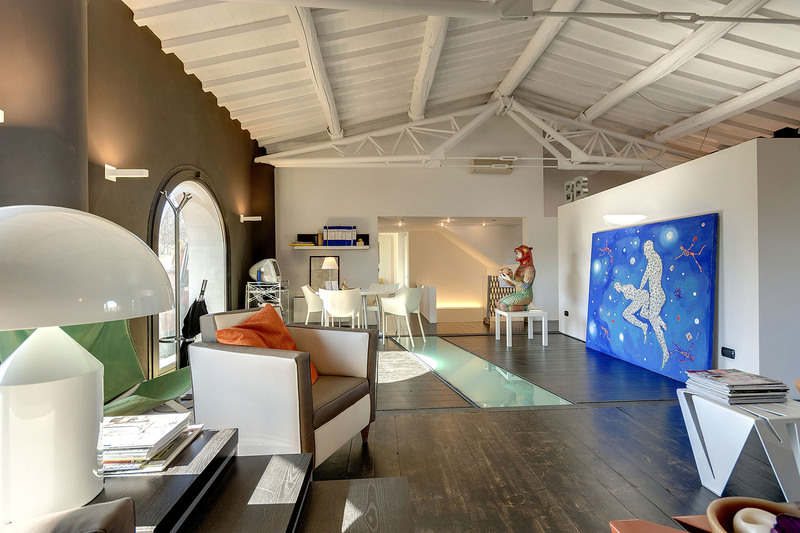 Only 15 km from the historic center of Florence, in “Villa Le Masse”, in the Tuscan countryside, is available a large apartment-loft, obtained from the restoration of the ‘barn’ of the villa, with still large arched openings, the high gabled ceiling and the generous size. Villa Le Masse, originally built in 1700, is in the territory of Montelupo Fiorentino, located at the south-west of Florence, logistically perfect in terms of connections; just 2 km there is the Ginestra Fiorentina exit of the freeway Firenze / Pisa / Livorno which allows you to get in 30 minutes the airport of Pisa and in 15 minutes Florence and its airport. Villa Le Masse is positioned inside a Natural/archaeological Park characterized by a pristine nature made of woods and pastures and vineyards; inside the park there is also an archaeological site with the presence of ruins of a Roman villa of the first century BC. The town of Montelupo Fiorentino, about 4 km far from the loft, is well known for its traditional manufacture of art pottery that dates back to 1400, having been the official manufacturing center of ceramics for the Medici family of Florence. The loft, formally the owner apartment (but he is almost always abroad), recently built and situated on the first floor of the villa, is on two levels, with direct access to private garden from which you enter the house. The Loft is composed of: a large double height living room ‘open space’ (with ‘living’, dining room, kitchen equipped with a central cooking island, home office area); the large master bedroom which is accessed by a staircase leading to the upper floor in the tower; a smaller room with a sofa bed (wide single bed), which gives access to the bathroom equipped with shower and washing machine. A pool in the garden is also available. From the living room, also entrance to the house, you come out on a terrace equipped as an outdoor living/dining room; from here with a ladder you go down in the large garden, which is also the house entrance from the private car parking. The interiors are designed by the home’s owner, an architect, in a very contemporary style. The environment itself is very modern and full of contrasting colours, presence of art and some spare ‘vintage’ furniture. The house can accommodate a maximum of 4 people, two in the master bedroom, 2 in the smaller one equipped with the sofa bed. The loft is also equipped with all the comforts, accessories, linens and everything you need for the kitchen, as this is the residence of Daniel when he is in Tuscany. The apartment is also equipped with WI-FI, TV and air conditioning.